Sara Zarr's newest book, Sweethearts, is the story of how we can be marked by a person or experience and carry that forward in our lives. Also, how that experience defines us, shapes us, and continues to impact us long after we think it should be over. It's part of the teen experience to reinvent ourselves, try on different clothes, personalities and friends. Or a time to morph into something we've never been before. Jenna Vaughn, happy, smiling, confident, popular high school senior works very hard to project an image she has constructed for herself. What no one knows is that long ago, she was Jennifer Harris, a young girl who was as different from Jenna Vaughn as is possible to imagine. Poor, hungry, a misfit. Although she has created and lived with this new image of herself for some time, she still has to work hard at pretending that it is her real self. It is not who she feels inside. She still mourns the loss of her childhood friend Cameron. He, more than any other person in her life, including her mother, defines how she views herself. A good part of the story is how Jenna reconciles her past and present selves, and prepares herself for the future. The catalyst for this? A young man named Cameron Quick which is a stellar name for a character. To describe Cameron and Jennifer as "childhood sweethearts" as much of the book promotion does demeans the depth and character of their relationship. As children, Cameron and Jennifer both lived in unpleasant circumstances and were the social outcasts at their elementary school. However, beyond having this in common, they had a complex and deep connection. They were each other's only friend, two halves of one person - focused on each other to the exclusion of anyone else. In fact, it comes as a surprise to both Jenna and the reader that she was unaware that Cameron had any brothers and sisters even though there were around when she knew him in elementary school. As a teen, Jenna still mourns the loss of Cameron who she has been led to believe is dead. She always carries with her that sense that he was the very first person to see and accept who she really was. She believes that if her new friends knew about her past, they would see her differently. So, she expends a lot of energy in projecting the right image. Even with a popular boyfriend, a circle of close friends, good grades, great clothes, and a lovely home Jenna feels herself losing her grip when Cameron reappears in her life. Cameron and Jenna navigate their reacquaintance and the emergence of the truth of what was really happening in Cameron's home with such affirmation of their deep connection that it affects Jenna's perceptions and opinions about her carefully constructed life. The realizations that each make about themselves and the different paths their lives have taken help them both reach conclusions about the kind of people they have become, where they should be headed and what they should be paying attention to. Zarr writes in a compelling way about the interior life of teens. Jenna is a very self-reflective narrator and perceptive critic of those around her. Jenna and Cameron are struggling with issues that belie their years and should make every adult rethink their assumptions that being young is some sort of shield against the emotional riptides of life. The profound loss of Cameron shapes Jenna's life. His cherished memories of her lead Cameron to find and reconnect with her when he is old enough to leave his home. For him, his friend Jennifer has literally been the light in his continuing darkness. The story's ending is in keeping with the many layered emotional landscape that the author has drawn for us. Sweethearts is difficult to read at times. It is painful to see children treated cruelly and having to live and relive those experiences. 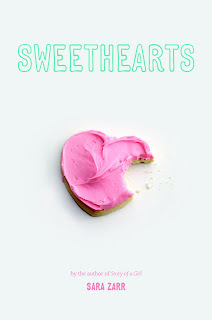 Sweethearts is not a light and frothy book, but in the end, it is a hopeful story and well worth reading.